The following is a guest post about financial independence. If interested in submitting a guest post please read my guest post policy and then contact me. Do you want to work … forever? REALLY. I mean all the way up until you die? I realize that’s a terrible way to start off a blog post, but it’s time for a little In-Your-Face TOUGH LOVE! Lots of people talk about how they’d like to make more money or have a better job. But that’s not really the secret to getting rich or getting any closer to no longer having to work. Learning how to be financially independent is a talent that very few people truly understand. But for those who do, it’s magnificent. And that’s what I want for you. So listen up, and help me help you achieve financial freedom. How to Be Financially Independent – For Real! First of all you have to realize that wealth is what you have, not what you earn. For example, a person making $500,000 per year could have less wealth than a person who makes $50,000. How? Suppose the $500K earner spends $400K of their income every year on whatever while the $50K earner only spends $25K per year. One is saving an average of 10% of their income while the other is saving 50%. • Who do you think will run out of money first? • Who do you think will be able to sustain their lifestyle for longer? 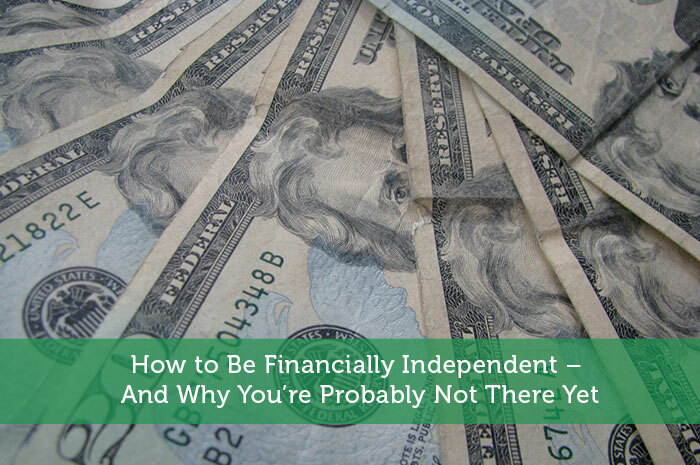 • Who do you think will actually be able to achieve financial independence first? If you said the $50K earner, then you’d be correct. Living paycheck to paycheck is how most people tend to live, and it’s a complete recipe for disaster. The larger the difference between your income and your expenses, the better! Focus on Income – Lots of Income! So while you might be able to focus on a few stand-out “expenses” and reduce them down a little bit, a more savvy person will focus on how they can grow the “income” side of that equation. Why? Because while you may be able to lower your expenses, you’ll never be able to bring them down all the way to zero. Sure you can and should keep them as low as possible. But at some point you have a quality of life you need to maintain. On the income side of the equation, the possibilities are limitless!! How can I make such an outlandish claim? Because you have to realize that income can come in many shapes and forms. Your income is NOT limited by your job. No, really! It’s true. You are NOT limited by how much money you earn (even though that’s how most of us will only ever think of our finances). It could actually be so much more. • Other assets or businesses that you own. • Any number of passive income methods. The smart ones among us focus on any number of these opportunities as a way to achieve financial independence. For example, you probably already know that you have to save for retirement. But do you know why or what the goal is? In theory if you were able to save $1,000,000, then you should be able to withdraw $40,000 from that pile of cash each year for the rest of your life. That means never having to work again! Think about how awesome that could be! You’d essentially be creating a money machine that pumps out income for the rest of your days. But absolutely none of that is ever going to happen until you start planning. None of this is ever going to materialize until you put together a plan and actually follow through with it. It’s not necessarily enough to know how to be financially independent, but you actually have to LIVE that plan each and every day. You have to participate at it and make it work – sometimes even when you don’t want to. I don’t care if you start saving for retirement at 30 or 40 or whenever. You have to start somewhere, and the best time is now! So don’t be a chump. Be the man. Make yourself rich, and achieve financial independence. It’s only your life! My hubs works as a Software Engineer for hours daily and one thing that he loves to do is to build a website. So after his work, he has a side job as a tester and building a website for some clients. Every little bit helps. What’s cool there is that it sounds like he gets to do a side job that he likes. Super low interest rates have eliminated the ability to make money via interest in the bank account. Have to invest elsewhere, which can be tricky! They won’t stay low forever. But you’re right for now, and that’s why I like to use high quality dividend stocks in the meantime. I need to create a income that is passive … if I can get it up to a point where it yields more than I spend in a month, I’ll have financial independence! Working with websites like it appears you’re already doing is a good start. It will take some time to build up, but it will get there eventually. I think it would be great to keep working until the day I die, hopefully into my hundreds! That’s absolutely true, and a fact that most people struggle with. A budget is like a lemon where it can only be squeezed so much until it runs out of juice. Money making opportunities, on the other hand, are limitless and can be scaled in ways that can multiply your income well beyond your own labor rate. It should be what everyone is aiming for – an engine that generates free cashflow without dipping into the principal! The only way to build that asset base is by simply living below your income and using the free cashflow to build the asset base. Question is, how big an asset base do you need? I’m aiming for $10m. The answer to that question depends on what you do to get there. For example if you plan to live off the interest from your savings, then yes, you’d probably need a few million. But then consider the blogging community. You’ve got plenty of examples of professional bloggers who make money from Adsense, Amazon, and other sources. They certainly don’t have millions of dollars, but they sure have found a different way to achieve financial independence. I learned this quickly after college. I knew that just working a 9-5 job wouldn’t get me to where I wanted to be in life, even if I saved 100% of my income! So I started branching off and working side business and selling things here and there. As time went on, I started tracking this “extra” income I make and it’s amazing how quickly it adds up. I make it a point to invest it all and can honestly say that I am much farther ahead of the game because of the extra money I bring in. Great article! I love how you mentioned that your income doesn’t have to come only from your job! I can come from other sources and opportunities! Investments are excellent for driving more possible income! Thanks for sharing!